Every year over 50,000 men in the UK will be diagnosed with prostate, testicular and penile cancer. Of these men over 47,000 will be diagnosed with prostate cancer, around 2,400 will be diagnosed with testicular cancer and over 600 will be diagnosed with the rare penile cancer. Sadly, these numbers are increasing. 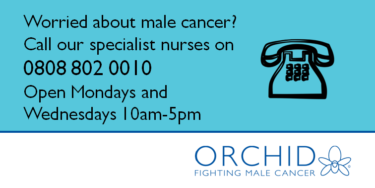 I) Support services – Orchid offers everyone affected by or interested in male cancer an extensive range of services. We offer a comprehensive information service staffed by specialist Male Cancer Information Nurse Specialists (see Appendix), a freephone National Male Cancer Helpline 0808 802 0010 and email helpline@orchid-cancer.org.uk, a portfolio of publications which are independently reviewed and evidence based, a testicular cancer microsite “Your Privates”, a telephone based Testicular Cancer Counselling Service, a dedicated website and newsletter low-down. Staff also run Roadshows across the UK offering support and information in the heart of the community. All our services are free of charge. Demand for these services continues to increase – last year we distributed over 550,000 items of information and ran over 200 Roadshows and community based events. II) Education and awareness campaigns – on a national level Orchid raises awareness of male cancer and educates men in the signs and symptoms of cancer. The Orchid Male Cancer Information Nurses and volunteers work closely with health and social care professionals, other voluntary organisations, community groups and support networks, schools, universities and local companies to deliver education and health awareness programmes and wellness sessions thereby ensuring men of all ages are well informed. In 2011 we launched the Orchid Community Golf Programme as part of our continuing commitment to education programmes for young people. This is a unique, exciting opportunity to bring golf to young people. Using specialist SNAG (Starting New at Golf) equipment, the programme is designed to encourage young people to keep fit and healthy whilst promoting good citizenship, community sport and learning about male cancer and the work of Orchid. The programme has already attracted over 28,000 participants. A new schools resource pack aimed at promoting awareness of testicular cancer amongst young people has recently been developed as part of the “Your Privates” testicular cancer microsite. The schools resource pack offers teachers display materials, banners and USB stick featuring lesson plans, a quiz and the “Your Privates” site. A new film featuring testicular cancer patients and an introduction from Alexander Ludwig, star of The Vikings and Hunger Games has also been developed. The film gives a very personal insight into testicular cancer from initial signs and symptoms to treatment and aftercare. There have been 48,398 visits to the “Your Privates” microsite since it was launched. The results of the survey were released throughout the Month. Targeting Health and Social Care Professionals. The campaign was widely promoted to health and social care professionals across the UK. Roadshows. Health information events took place across the UK. A Male Cancer Roadshow was held in Lewisham. There was excellent coverage of the Awareness Month with over 272,000,000 OTS (Opportunities To See) across 120 media outlets. Highlights included articles in the Mail on Sunday, The Sun, GQ, The MailOnline, The Telegraph Online, Medical News Today, The Oncology Nurse, Boots Magazine, Yahoo and Female First. te Kilby. “Go Nuts” Week launched on the 18 April 2016. The focus of the campaign was to “Go Nuts” and raise awareness of male cancer. Activities during the Week included the launch of a “Go Nuts” Facebook campaign, “Go Nuts” fundraising activities, the Orchid 5k and 10k River Run and the launch of an App to raise awareness of Orchid and the importance of self-checking, “Know Your Balls – The Game”. III) A pioneering, world class research programme – our funding of innovative research in the cancer field remains a key focus of Orchid’s work. The research programme aims to encourage, support and fund research into the causes, prevention and treatment of male cancers. It has identified new ways to treat male cancers and improved our understanding of how these cancers behave. The four programmes of research include molecular biology and cancer genetics, histopathology, cancer epidemiology and clinical trials. In December 2011 we were pleased to announce the appointment of Professor John Kelly as the Orchid Chair in Male Genito-urinary Oncology. Professor Kelly is a Consultant Urological Surgeon, Professor of Uro-Oncology and Clinical Lead of Uro-Oncology based at University College Hospital, London. Alongside existing research commitments we approved an exceptional grant in March 2013 for an exciting new global research study led by Professor Tom Powles, a leading expert in the field of testicular cancer. The aim of the study is to improve the understanding of the development and progression of testicular cancer and to offer the possibility of new treatment and management techniques for men with testicular cancer that has returned and spread beyond the testis – these patients are currently likely to die from the disease. The study involves collaborations with researchers across the United States, Germany, Italy, UK, France, Denmark and Ireland and places Orchid firmly on the global map. In 2013 the Orchid Study and Travel Award Programme was launched aimed at supporting young people in the field of male cancer research. Building on these many achievements, Orchid’s research strategy promises to make a real, tangible difference through supporting research which will improve our understanding of the risk, diagnosis and treatment of male cancers. Ultimately our aim is to promote, support and accelerate step change in cancer management thereby improving the outlook for men and their families. In recent years Orchid has enjoyed a number of successful partnerships with the business community including Paperchase, King Sturge, Next, Bath Rugby Club, Brooks Brothers, The Bluebeards Revenge, GCS Recruitment, Easy As HGV and Raging Bull. We were chosen as a beneficiary of the ICAP Charity Day 2011 to support the Orchid Tissue Bank and are the Charity of the Year for ASDA Distribution in 2016. Our work with their UK depots, their 15,000 colleagues and the local community is helping to ensure we can support even more people affected by or interested in male cancer. 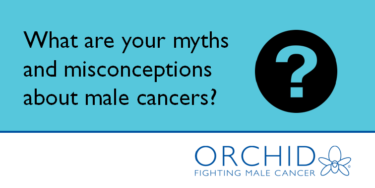 Orchid works with other voluntary organisations and networks to campaign for improved services for men and their families including Cancer Research UK, Macmillan Cancer Support, British Association of Urological Nurses, Prostate Cancer UK, TACKLE Prostate Cancer and the Penile Cancer Supra-networks. Orchid plays a full part in the Cancer Campaigning Group and Cancer52, an equivalent collaborative concerned with less common cancers (i.e. all those except prostate, lung, breast and bowel disease) that together account for around 52% of all cancer deaths in the UK. Orchid’s Chief Executive is on the Board of Cancer52. In 2012-2013 Orchid took part in a number of important projects. The charity was invited to join an advisory panel for PEPC, a www.HealthTalkOnline.org.uk project on penile cancer funded by the Research for Patient Benefit programme of the National Institute for Health Research. The penile cancer site was launched on the 23 October 2012 at a Reception at the Royal Society. The site is an important source of support and information for men and their families and has been featured in national media including Radio 4 and The Guardian. Orchid was also invited to join the National Cancer Intelligence Network – Urology Site Specific Clinical Reference Group (NCIN Urology SSCRG). NCIN is a UK-wide initiative, working to drive improvements in standards of cancer care and clinical outcomes by improving and using the information collected about cancer patients for analysis, publication and research. Sitting within the National Cancer Research Institute (NCRI), the NCIN works closely with cancer services in England, Scotland, Wales and Northern Ireland. In England, the NCIN is part of the National Cancer Programme. Orchid has taken part in several roundtable policy discussions to examine variations in prostate cancer care and to campaign for improved services. Three new reports were launched: in February 2012 “The Forgotten 10,000: Getting it right for men with prostate cancer” was launched with support from Ian Liddell-Grainger MP. “Prostate Cancer in BME Communities Raising Awareness and Improving Outcomes” was launched at the end of November 2012 with support from Paul Uppal MP Vice-Chair of the All-Party Parliamentary Group on Men’s Health. In October 2014 we launched “More to do: Identifying and tackling the unmet need in prostate cancer care” with support from the Rt Hon Paul Burstow MP. The report highlighted shortfalls in the quality of information and support offered to men with prostate cancer compared to other cancers and made 15 specific recommendations to drive change and improve prostate cancer services and overall quality of care. Orchid is a small, dynamic charity. We rely on voluntary income to meet our commitments to supporting men, their families and those with an interest in male cancer. Funds are raised through individuals, events, the business community, trusts and foundations. In 2017 we will celebrate our 21st Birthday. We will launch a new and ambitious strategy aiming to improve the outlook for men affected by prostate, testicular and penile cancer. We hope you will join us in what promises to be an exciting year. Reviewed 7/02/2019. Next review 7/9/2019.